Although I am not at ASCA (#NotatASCA14) I do not let that stop me from joining in on the learning experience and professional development. I hope you are joining in on the fun too. If you aren’t sure where to begin check out my previous post that is filled with tips for those not at ASCA. 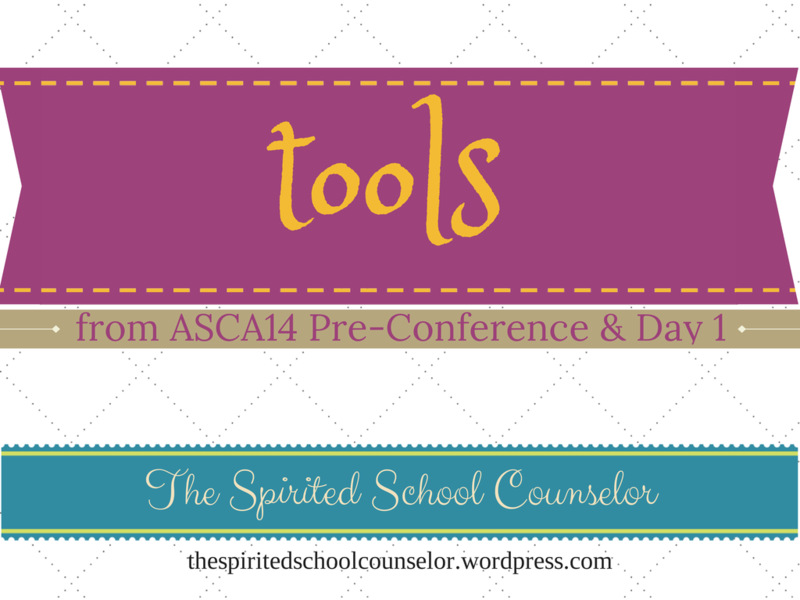 I thought it may be helpful to jot down all of the helpful and new resources I learned about via social media and the ASCA app website. Here is the run down for the pre-conference and day 1. I am sure I didnt catch all of the awesome information that was given out, so please comment below with some of your favorite discoveries while attending #ASCA14 in Orlando or vicariously through others. Career Counseling – Resources from the National Alliance for Partnership in Equity (NAPE). Going GaGa for Google – handout from ASCA Conference session. If you click on one link make it this one – AWESOME resources! 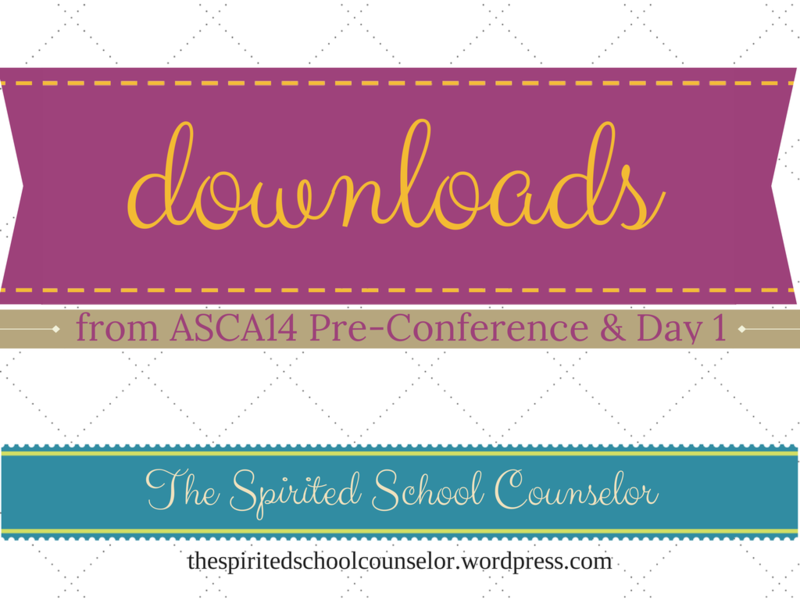 **ASCA App Session Downloads – I havent made my way through them all… yet. 8 Components of College & Career Readiness Counseling (College Board) – College board has created a handy and helpful document that focuses on 8 components of college and career readiness. This handout breaks down what areas should be focused on and covered by counselors in elementary, middle, and high school. 25 Best Marketing Blogs of 2014 – The Counseling Geek, Jeff Ream, suggested checking out this site after his presentation on Branding & Marking your school counseling program. 40 Developmental Assets for Adolescents from Search Institute – Provides a list of 40 items that can help students be successful and then has action steps to take to make those assets happen. Big Future (College Board) – Great resource for high school students, families, and staff. I used a lot of their videos and information in presentations I gave to underrepresented high school students during graduate school. B.I.O.N.I.C. Team (Believe it or not I care) – A bullying prevention program that focuses on saying H.I. Lots of videos to use with students as well. C3 Counselors Grant – This website has lesson plans for grades K-9. The lessons are broken down by grade level and focus on one of four topics: Career/College Readiness, Respect, Responsibility, & Safety. If you click on “more” you will also find a number of form templates to download. Elementary School Counseling – A blog by Melissa Rex. She has great lessons on her website that you should check out if you work with students K-6. Middle School Counselor Notes – Rick Scheibner put together a great list of tweets that came from the Branding & Marketing your School Counseling Program session. Parent Further – This website has resources to help professionals and parents work together better. Pikesville High School Counseling Department – An example of a great school counseling website, along with a list of great professional resources. Rachel Simmons – “Rachel Simmons is an author, educator and coach helping girls and young women grow into authentic, emotionally intelligent and assertive adults.” I love her Girl Tips! School Counseling Solutions – Brief counseling strategies for school counselors. School Counselor Space – Franciene Sabens is taking notes via google drive from #ASCA14 for all to see. Check out what sessions she is attending and the AWESOME things she is learning while attending the conference. This is such a great idea and I am so thankful she decided to share her notes with me (and you too!). Social Networking in the Classroom: Talking to Students about Sexing – A great blog that covers issues like bullying, social media, and internet safety. This particular article focuses on how to talk with students about sexting written by Josh Gunderson. Vision Boards – Lisa Burton’s pinterest site on vision boards. Watch D.O.G.S. – a volunteer program that focuses on getting fathers involved at school at least one time a year. Webinars for School Counselors – This website has tons of resources on how to create your own webinars for your counseling program. You Can Go (College Board) – Catherine Allen recommended using this site with middle school students, which I love. It will help get students to start picturing themselves attending college. I really like the PLEDGE feature. Start the college culture movement early in middle school with a pledge! 101 Solutions for School Counselors and Leaders in Challenging Times by Stuart F. Chen-Hayes, Melissa S. Ockerman, & E.C.M. Mason – Covers a variety of important topics like achievement gap solutions, college and career readiness, and partnering with families & the community. Envision the Future by Lisa Burton & Jonathan Lent – technically not a book, but an ASCA article on using vision boards with students. You must log in to view this article. Impact Therapy: The Courage to Counsel by Ed Jacobs & Christine Schimmel – An active and engaging approach to individual and group counselor. *I am currently reading this book and love all of the ideas! They also have a website to check out too. Mistakes I Made at Work: 25 Influential Women Reflect on What They Got Out of Getting It Wrong by Jessica Bacal – They also share how these mistakes paved their way to success. Redefining Girly: How Parents Can Fight the Stereotyping and Sexualizing of Girlhood, from Birth to Tween by Melissa Atkins Wardy – a book on how parents can fight the sexulization of girls from birth to tween. Anything by Seth Godin – recommended by The Counseling Geek, Jeff Ream. He also suggested checking out this list of the Top 10 Marketing Books of All Time. MailChimp – Create beautiful email newsletters easily and free! PowToon – Create free animated videos and presentations to captivate even the toughest group. Remind – Remind is a safe and free way for school staff to text students and parents. Schedule Once – This tool will help keep your schedule straight, while integrating with your other digital calendars. Career Construction Interview & Student Career Construction Inventory – resources to use with students from vocopher. Vision Board Pro – An apple app that allows you to build vision boards digitally. Yoga 4 Classrooms Card Deck – 67 yoga and mindfulness-based activity cards to use with students or staff. Always: #LikeAGirl – a video about how the term “like a girl” can impact our girls. Its powerful and one I plan on sharing in the future with students. Girl Rising – Below is the official trailer, but there is also a website which has information about a movement to empower girls. Escaping Video Game Addiction: Cam Adair at Ted X Boulder – A TED talk on the power of video games and the impact it can have on our students. Said No Teacher Ever – This video will make even the toughest cookies crack a smile. It would be a great video to show at the beginning of the year, a professional development session, a staff meeting, or anytime you feel the staff needs a little laugh. The Power of Words – This video gave me goosebumps when I watched it the first time. Your Body Language Shapes Who You Are: Amy Cuddy – A TED Talk. Thanks to Catherine Allen, Phil Echols, Jeff Ream, Rick Scheibner, Franciene Sabens, Jasmine Finch, Carol Miller, Keith McMillin, MaltiT, and the many others who are at #ASCA14 sharing resources via social media for those #NotatASCA14. I am sure there are tons of resources I didnt mention or havent had a chance to check out yet. 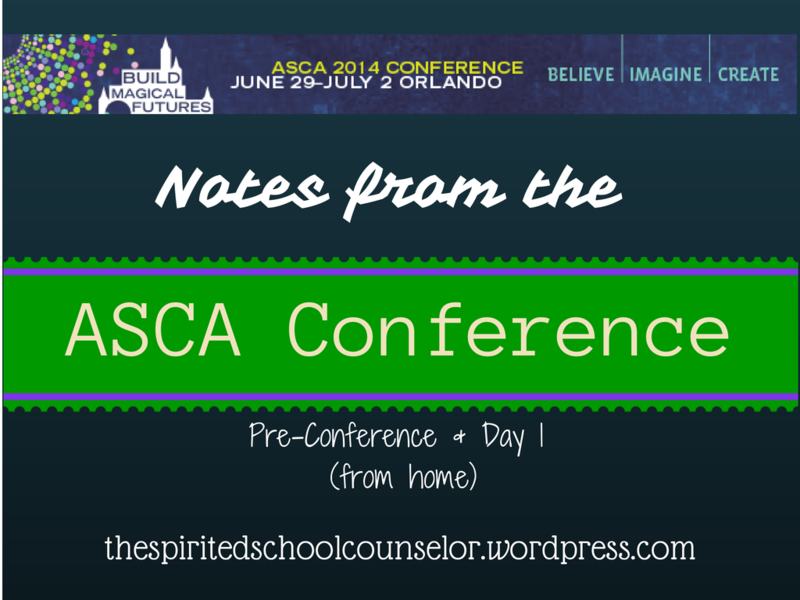 What are your favorite finds from Day 1 at ASCA? Check back soon for resources from ASCA Day 2. Thanks for stopping by! 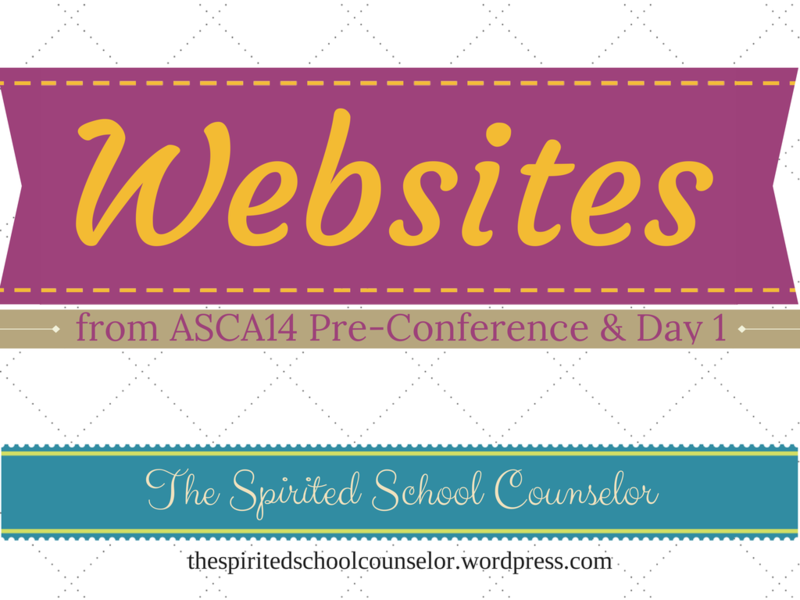 Categories: Counseling, Graduate School, Online Resources, Professional Development, School Counseling, Technology | Tags: #ASCA14, #NotAtASCA14 | Permalink. You are so welcome Franciene! I love your blog. 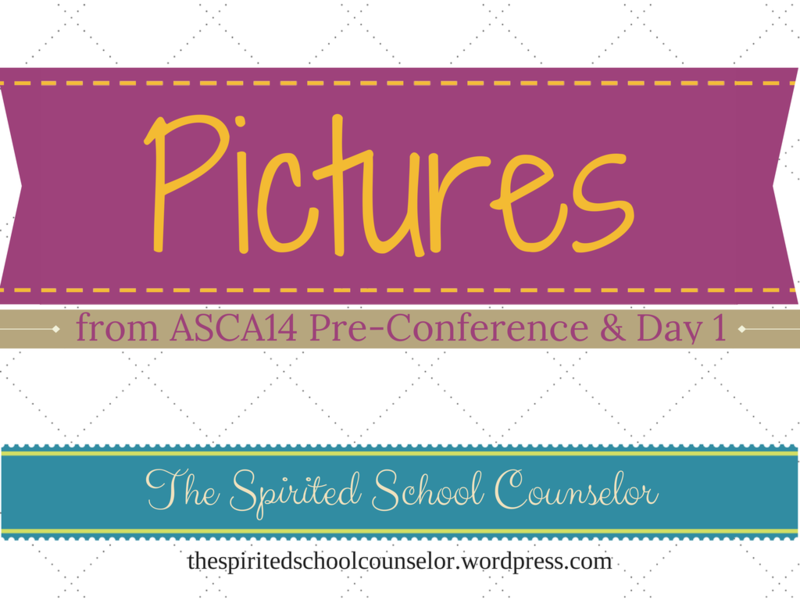 I hope to be at ASCA15. Found this blog (and entry)…. Suddenly had 20+ tabs open in Google Chrome. Loved it! I just finished my first year at the middle school level. Let me know if you have any questions/concerns. Thanks Kasey! I might have to take you up on that offer. Glad I could help. The last ASCA post will be up tomorrow morning. Hope you stop by again soon.